Looking to find that perfect Cabo tennis retreat, enjoy a tennis lesson or just know where to find tennis courts in Cabo San Lucas. Whether you are a championship tennis player or a beginner, you will find the information you need about Cabo San Lucas tennis below. All Cabo San Lucas tennis courts are outside but with over 300 days of sunshine, playing tennis in Cabo should never be a problem. Some tennis courts have flood lights if you want to enjoy your Cabo tennis at night. Ask your hotel before booking, as some Cabo hotels charge for the use of the lights. There are many Cabo San Lucas hotels and resorts that have tennis courts. These courts are located on hotel and resort property for guest use and some Cabo resorts allow public access for a booking fee. If you are staying at an all inclusive resort, your Cabo tennis playing will be included in your stay. the local store chains like Mega or Walmart . 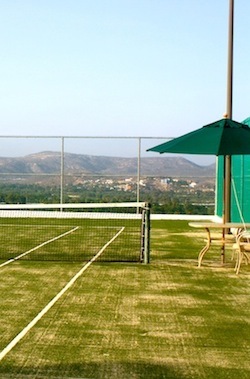 The best places for tennis lessons in Cabo are Pedregal Tennis Club and Palmilla Tennis Club. Both offer instructors and professional playing surfaces.